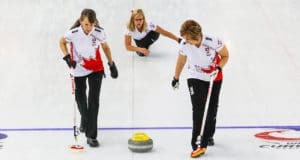 The M&M Meat Shops Canadian Junior Men’s and Women Curling Championships are returning to Newfoundland and Labrador for the first time in three decades. The Corner Brook Curling Club will co-host the 2015 Canadian Junior Men’s and Women’s Curling Championships. The Canadian Curling Association (CCA) announced today that the 2015 edition of the M&M Meat Shops Canadian Juniors will be staged in Corner Brook, N.L., Jan. 24 to Feb. 1. The Pepsi Centre and the Corner Brook Curling Club will co-host the event, with the finals being played at the Pepsi Centre. It will be the first time that Newfoundland and Labrador has hosted the Canadian Juniors since 1985, when Alberta’s Kevin Martin prevailed (the men’s and women’s events were operated separately until 1987). It will mark the 10th year of title sponsorship by M&M Meat Shops, Canada’s leading retail chain of specialty frozen foods. TSN, the official broadcaster of the CCA’s Season of Champions, will provide live and exclusive coverage across Canada of the women’s and men’s finals. 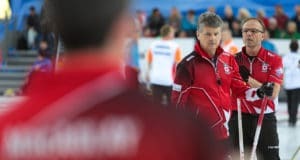 With 14 teams in each gender (representing each of the 10 provinces in addition to Northern Ontario, the Northwest Territories, Yukon and Nunavut), the field will be split into two seven-team pools, with seeding based on win-loss records at the 2014 Canadian Juniors in Liverpool, N.S. Teams will play a round robin within their pool, leading to a championship pool beginning on Wednesday, which will then lead to the weekend playoffs. Teams that don’t qualify for the championship pool will play a seeding pool to determine rankings for the 2016 Canadian Juniors (host site TBD). Meantime, non-playoff teams will participate in a mixed doubles competition. The Pepsi Centre in Corner Brook will be the location for the men’s and women’s finals. 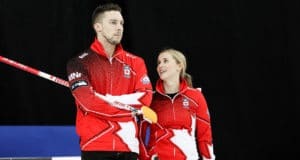 Newfoundland and Labrador teams have won twice at the M&M Meat Shops Canadian Juniors; Brad Gushue captured the 2001 men’s championship at St. Catharines, Ont., while Stacie Devereaux prevailed in 2007, again in St. Catharines. It will be the fourth time Newfoundland and Labrador has hosted the Canadian Juniors — Alberta’s Brian Howes won the men’s title in 1966 at St. John’s; Saskatchewan’s Patricia Crimp won the women’s title in 1975 at Grand Falls; and Martin won the men’s title in 1985 at St. John’s. The men’s and women’s champions in Corner Brook will represent Canada at the 2015 World Junior Men’s and Women’s Championships (site TBD). Canada has won a leading 17 world junior men’s titles since 1975 and eight women’s crowns (Scotland leads with nine) since 1988. The last Canadian teams to win world junior titles were skipped by Saskatchewan’s Marliese Miller in 2003 in Flims, Switzerland, and by Alberta’s Brendan Bottcher in 2012 in Östersund, Sweden. The 2014 M&M Meat Shops Canadian Juniors are scheduled for Jan. 18 to 26 in Liverpool, N.S., with the winners advancing to the World Juniors in Flims, Switzerland.